Hosting your website on a virtual private server in USA can mean a lot for your international business? Everdata Technologies has multiple plans for virtual server Hosting in USA with advanced technologies, resources and equipment. USA is the hub for web hosting and development business and therefore a highly competitive market to stand in sense of pricing and quality. That is the reason why we provide quality services at very affordable prices. 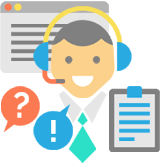 We have proved ourselves in the USA hosting market with our unbeatable prices and exceptional 24×7 customer support services. 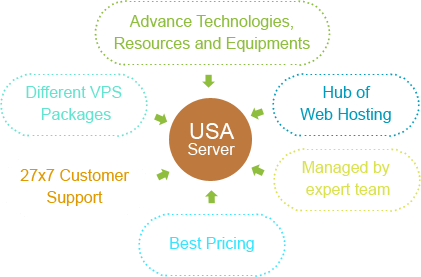 We have designed number of USA VPS hosting packages that suit everyone's budget so you won't ever be disappointed with the cost of our virtual servers and your budget. The best thing is that all virtual private servers are completely managed by us so you don't have to be technical at all. 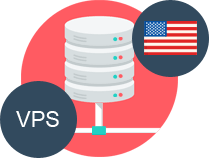 Our US VPS Hosting plans offer you fully scalable resource management solutions ensuring complete ownership over your resources for Instant distribution. Intuitive control panel with maximum controls facilitates independent and efficient site management. Our security measures are periodically revised to offer you maximum protection against latest security threats. Contact our 24X7 quality support to buy cheapest vps hosting usa plans. We assure you prompt and precise solutions to all your queries/issues. EverData's vast and versatile experience in VPs hosting field has helped it in developing a keen analytical ability to identify your VPS hosting needs and cater to them efficiently. We have a wide collection of US VPS plans so that you can choose the most suitable plan that precisely caters to your business needs and fits well into your budget.